You should now have the summer issue of PATH Intl. Strides magazine with the 2013 PATH Intl. Conference Registration Book. In it, you will find the sessions schedule, hotel information, some fun things to do in Orlando, the Horse Expo line-up with the closing event at Arabian Nights and of course the registration form. Online registration is now open. Click here to download the registration book. If you have questions about registration, contact Karen Province or call her at (800) 369-7433, ext. 111. If you feel baffled at times by the names, types, functions and usefulness of social media, "Has Social Media Changed Everything ... or Nothing in Center Fund Development?" is the session for you. Arlene Alen, vice president/director of marketing and development for Horses with H.E.A.R.T., Inc., in Chino Valley, AZ, and PATH Intl. Board of Trustees member, discusses social media campaigns for fund development and why a plan is necessary. Equine-facilitated learning is growing by lengths and strides. In the interactive session "Saddle Up for Success With Equine-Facilitated Learning," presenters Debbie Anderson and Blair McKissock explore what defines EFL, the training required and will give an overview of facilitation techniques for centers to create diverse, sustainable EFL programming. Join us for Destination: Success! Our third annual Rein Them In Member-Get-A-Member drive ended on June 30th, and resulted in numerous new member referrals. Congratulations to Cindy Joyce from Region 1 who won the pick-a-trip weekend and to Healing Strides of VA from Region 3 who won the second prize of a $100 gift card. All members who recruited new members were entered in to a drawing for a free conference registration, and Helen Jennings from Dubai was the lucky winner. Thank you for helping to keep our association strong! Starting September 1, 2013, membership renewal notices will be sent electronically. Individual and instructor members will be able to renew online or by downloading a membership renewal form and the instructor compliance form from the PATH Intl. website on the My PATH Intl. Membership page. To ensure that membership renewal notices are received, members will need to be proactive in keeping their email address current in their member records. If you have questions regarding updating your email address, please contact Jorian Stuckey, (800) 369-7433, ext. 119. PATH Intl. will hold the webinar "Riding in the Moment: A Program for Persons With Alzheimer's Disease and Other Forms of Dementia" on August 24, 2013, at 5 p.m. Mountain time. It will be presented by Stef Vikora, Program Director at Hearts and Horses, a PATH Intl. Premier Accredited Center in Loveland, CO. If you would like to attend this pertinent and informative topic, contact Denise Fager or call her at (800) 369-7433, ext. 114. All of us who own/manage horses are interested in optimizing their health and improving their performance. Understanding how the quality of forage they eat can affect their digestive function and their health is a great place to start when reviewing best management practices. Part I will highlight the importance of knowing the forage 'type' and 'quality' you are feeding at your center. Putting this knowledge to use will greatly benefit your horses' over-all health and performance. Part II will feature how the horse's digestive system functions and why they are selective 'continuous' grazers of forage. See why feeding more forage and less grain mixture is better for your horses' health and your pocketbook. The July winner of the Bimeda Volunteer Award was Michele Sandefur of Therapeutic Animal Partners in Columbia, TN. "Michele has been a gracious volunteer for 13+ years. She is a PATH Intl. Instructor, weekly feeder for our equine partners, supporter at numerous special events and the veterinarian to our barncats and bunnies." Your center can recognize and thank a volunteer. Nominate a volunteer from a PATH Intl. Center, and he or she will have a chance to receive a "Thanks for Your Time" Bimeda $50 American Express gift card. In addition, Bimeda will donate a 25 dose pack of Bimectin, Exodus and Equimax dewormers to the volunteer's center. Visit Bimeda Equine for details. A big congratulations to all the winners and nominees! Every year, PATH Intl. centers and members nominate the very best equestrians, certified professionals, veterinarians, volunteers and equines serving at PATH Intl. Centers, and we are pleased to announce the regional and equestrian award winners. Each year becomes more difficult to choose from among the outstanding nominations. This year, PATH Intl. received an astounding 227 nominations, demonstrating once again the high quality of service our centers offer. It takes a lot of time and thought to nominate someone, and we thank everyone who nominated someone. (Remember that nominations are now accepted year round.) A special thank you also to our judges for making the difficult decisions. 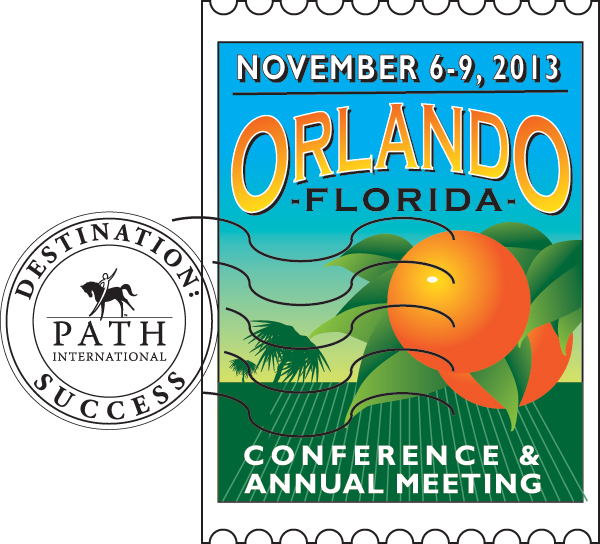 Click here to see a list of the 2013 PATH Intl. Region Award Winners. Help PATH Intl. and possibly win a prize by taking 10 minutes or less to tell us about your purchasing habits! In order to serve our members best, we seek to partner with appropriate industry organizations and companies. So every couple years PATH Intl. gathers purchasing data on its membership. If you have any questions, please contact Megan Ferry at PATH Intl. Thank you in advance for your participation. The Niche Gallery in Saratoga Springs, NY, announced the opening of its new show, "The Foal Project," a series of images taken by photographer Lisa Miller, who has been responsible for a couple of covers of PATH Intl. Strides magazine. These 40" x 60"signed and numbered limited edition pieces are printed on metal and depict the moment of connection between a mare and her foal at birth. The "Foal Project," which will be at The Niche through the end of August, is a not for profit traveling gallery show to raise awareness and funding for equine-assisted activities and therapies. Proceeds go to the Foal Project Donor Advised Fund established at the Adirondack Trust Company Community Fund in Saratoga Springs, NY. From there, the funds are used to fill grant requests made by equine-assisted activities and therapies centers. Some of the centers that have received funding from the Foal Project Donor Advised Fund include Wild Hearts Therapeutic Equestrian Program in West Bridgewater, MA; Jackson Hole Therapeutic Riding Association, a PATH Intl. Premier Accredited Center in Teton Village, WY; and STAR Riding and Driving, Inc., in Aiken, SC. contact Lisa Miller at studiodiluce@gmail.com or (315) 525-8184. 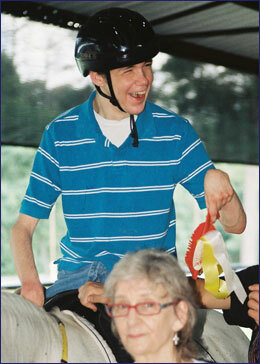 Would your program like to reward your riders and volunteers with donated ribbons? Perhaps your center would like to create a ribbon tree or ribbon wreath out of donated ribbons for your next fundraiser. Ribbon Recycling collects donated ribbons for distribution to therapeutic riding centers and directs donors to "donate locally," as well. Please let Ribbon Recycling know if your center would be interested in receiving donated ribbons. Simply fill out the form on its site. Include in the comments that you would like to be contacted by ribbon donors. Ribbon Recycling will then list your center on its site so that local donors may contact you directly. If you have questions, contact Julie Beaulieu at Ribbon Recycling. Unless otherwise noted, contact Denise Fager at (800) 369-7433, ext. 114, with questions. All dates are subject to change. To register for an event, please contact the host site directly. You can locate its contact information under Find a Center on the PATH Intl. homepage or on the PATH Intl. events calendar. Workshop is held the first 2-1/2 days, certification held the last 2-1/2 days. Specific schedule sent by host site. Specific schedule sent by host site. Please visit the PATH Intl. events calendar for a list of 2013 Registered On-Site Workshops and Certifications. Please direct correspondence about this newsletter to PATH Intl. eNews coordinator. PATH Intl. eNews is a benefit of Professional Association of Therapeutic Horsemanship International membership. No portion of this publication may be reproduced by any mechanical, photographic, scanned or electronic process without written permission from PATH Intl. PATH Intl. reserves the right to reject, accept and edit submitted material. PATH Intl. eNews is intended as an information exchange and an opportunity for communication for members in the field of equine assisted activities. The opinions, practices or products presented in PATH Intl. eNews do not necessarily reflect PATH Intl. policy, imply PATH Intl. endorsement or comply with PATH Intl. standards. If you prefer not to hear from us, just click on the "safe unsubscribe" below and we will remove you from our mailing list. Removing your email address from the PATH Intl. members database will prevent you from receiving all email correspondence including event notices and other time-sensitive correspondence.